Story time tonight before you get to the recipe. So my posts have been a little delayed lately. Two reasons. 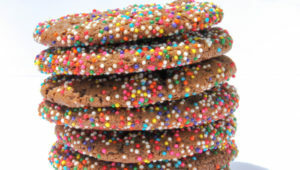 One, I have a big project at work that we’re in the big final stretch for so I’m keeping up with the cookie baking, but the blogging is a little delayed. Baking is my stress therapy so you lucky coworkers can anticipate a lot of baked goods between now and the end of November. Secondly, there is a mouse in my apartment terrorizing me. They have been doing construction ripping up all of the streets around my apartment, so all the neighbors allegedly have furry friends. I wasn’t too bothered by Mickey when all he was doing was occasionally popping a squat and pooping on my stove. My entire kitchen has been cloroxed multiple times. But then last Thursday night happened. I was working late night entering some content into this new site, when Mickey shot out from under my couch and skidded into my kitchen. So I did the only natural thing. 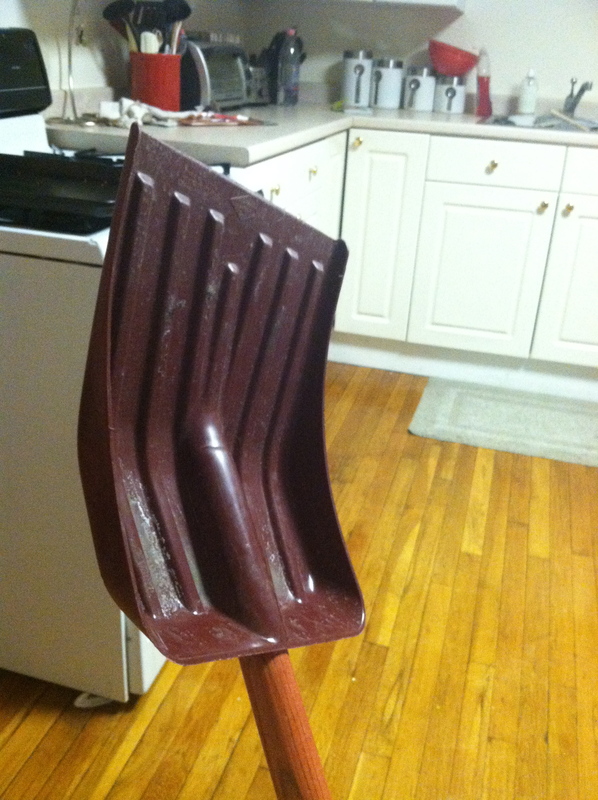 I put on my knee high rainboots, grabbed a shovel, and popped a squat on top of a barstool trying not to breathe. Needless to say. This is a very smart mouse. Since I could not sleep for fear he would find my bedroom and gnaw my face off, I even made this little trail of cheese leading up to the traps … which he ate the cheese, pooped, and did not go into the death trap. Game on Mickey. There are now 12 different traps around my apartment. Which will probably make for an uncomfortable day tomorrow when I am trapped in my apartment due to the hurricane. Anyways. 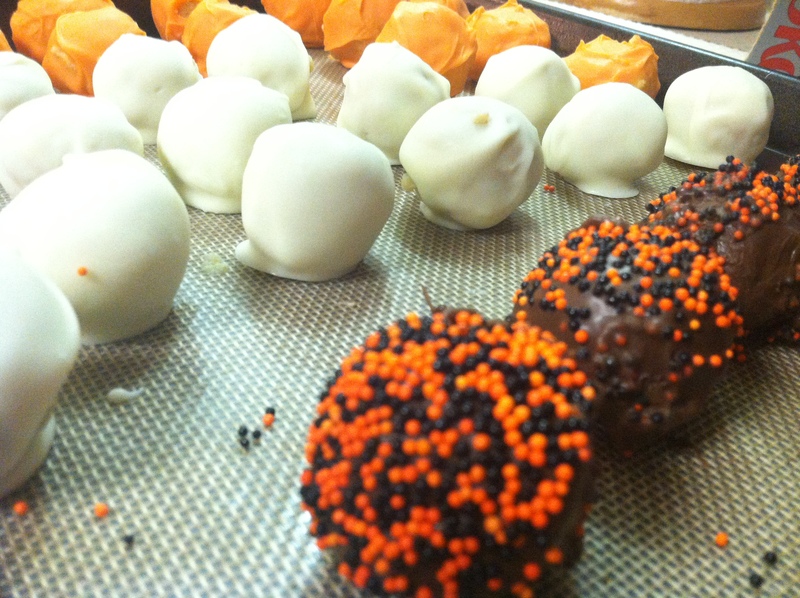 The mouse hunting came after a very eventful two-day cake pop making extravaganza. At work we had coworkers kids come in last Friday for office trick or treating. 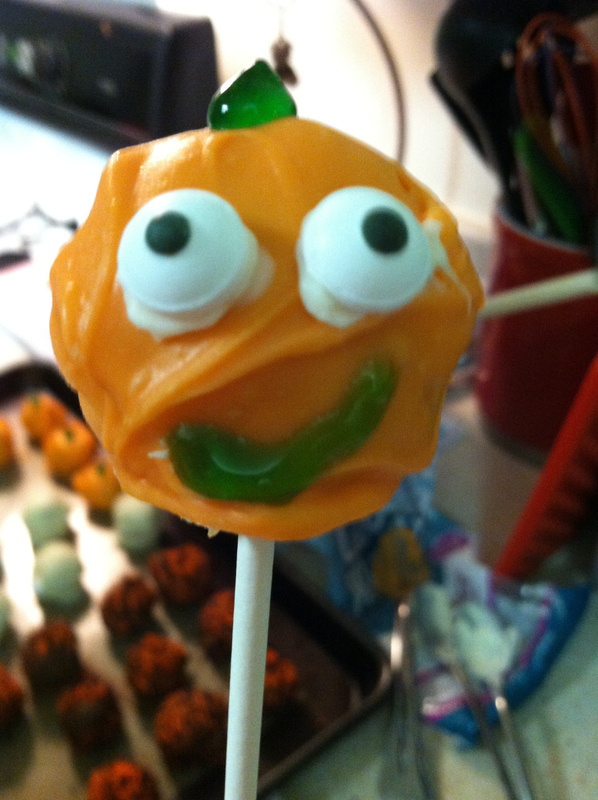 So I figured it was a perfect time to test out these Halloween cake pops. My friend Sarah came over with a bottle of wine, which was much needed for this experiment. We made two batches, but here is what you need for one batch. 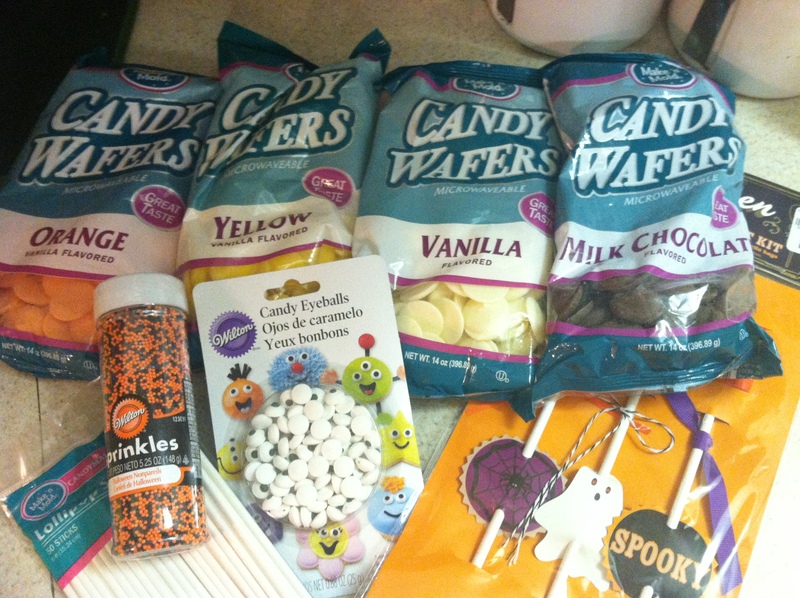 My friend Allie and I hit up iParty the other day, and I stocked up on melting chocolate for this baking experiement. Step 1: Bake the cake per the instructions on the box. It does not matter if you make it in 13×9 or 2 small round dishes. You just don’t want to overbake it so that edges are crunchy. 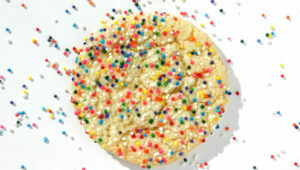 Funfetti is my personal favorite, but you can use any cake of your choice. 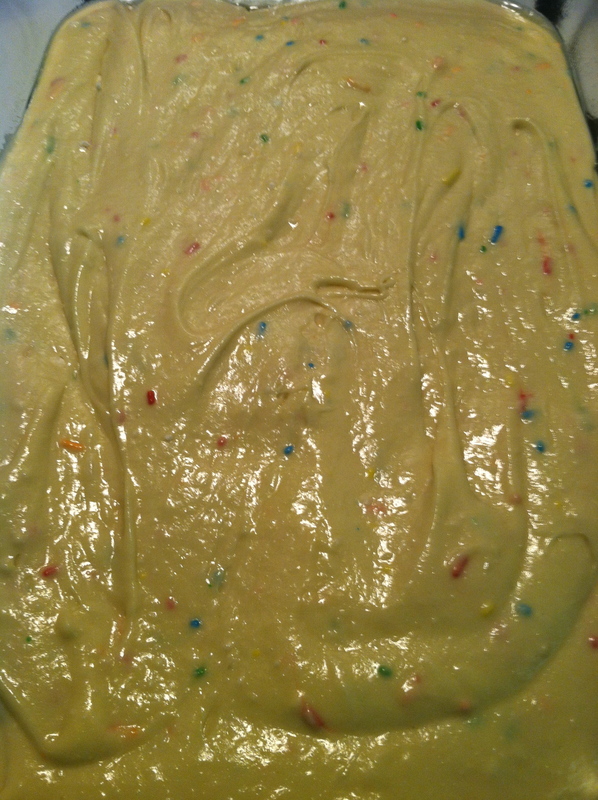 Step 2: Let the cake cool. If you are impatient like me, stick it in the fridge and have a glass of wine. 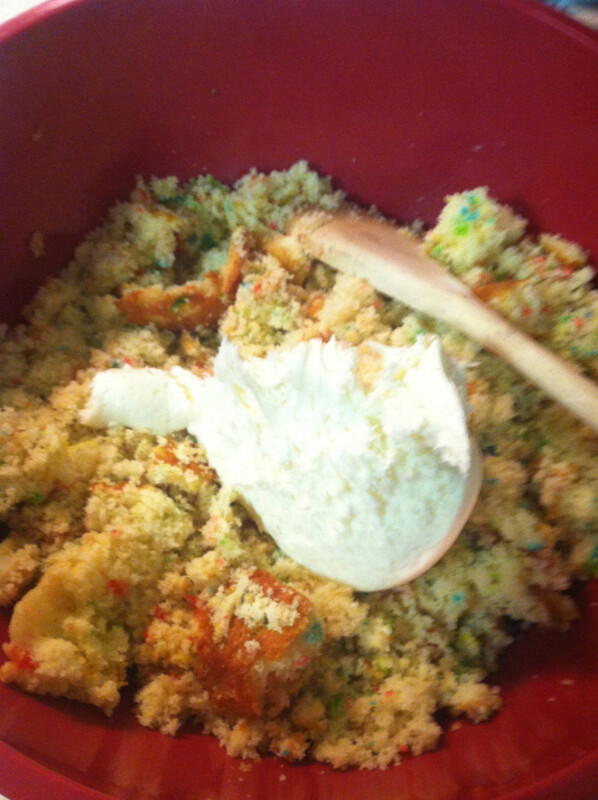 Once the cake is cool, crumble it into a large bowl. 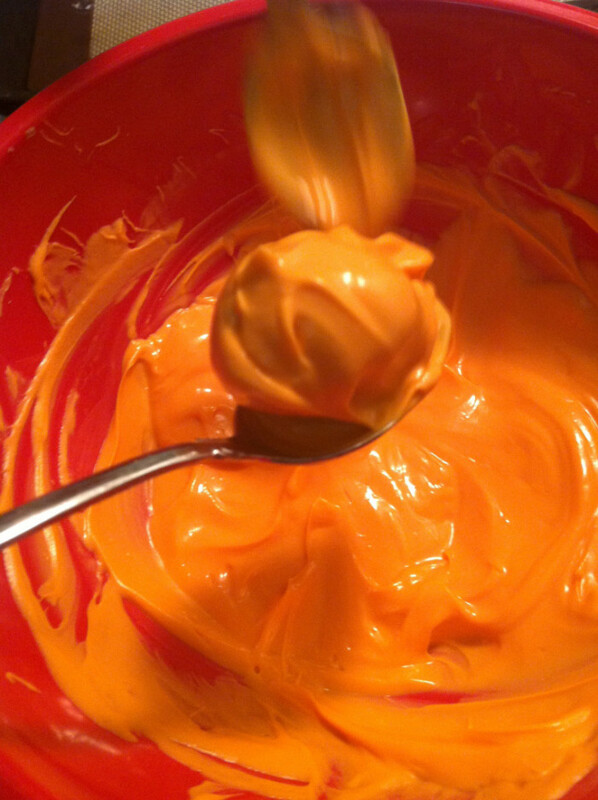 Step 3: Add in about 3/4 of a can of frosting and mix well. 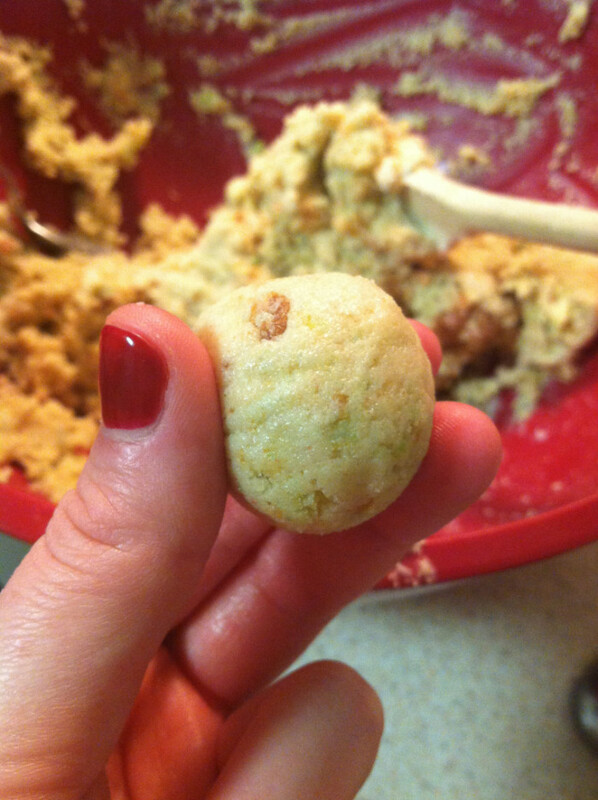 Step 4: Using a small cookie scoop (or teaspoon) make small even-size balls of cake. Place them on a parchment lined baking sheet. Put them in the freezer for at least 30 minutes until they are hard. 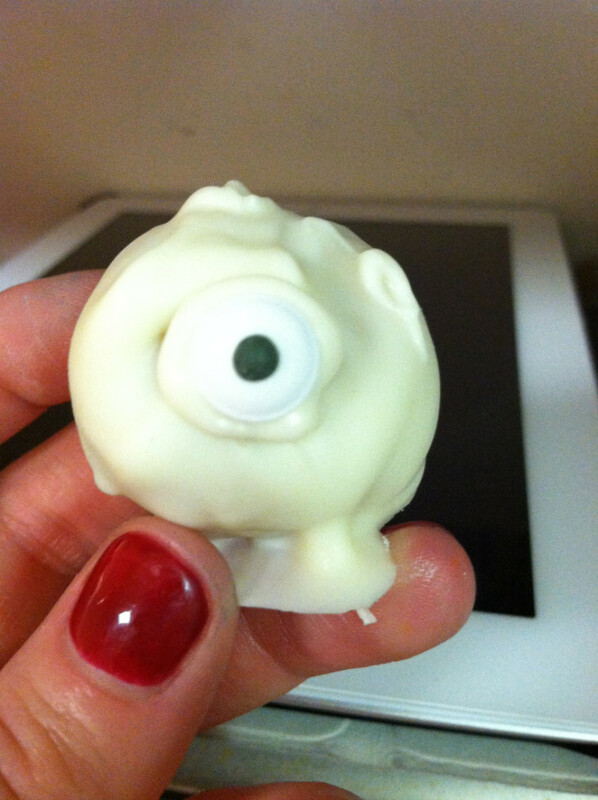 Step 5: Use the melting chocolate of your choice. There are so many options for Halloween! Melt the chocolate, being careful not to burn it. 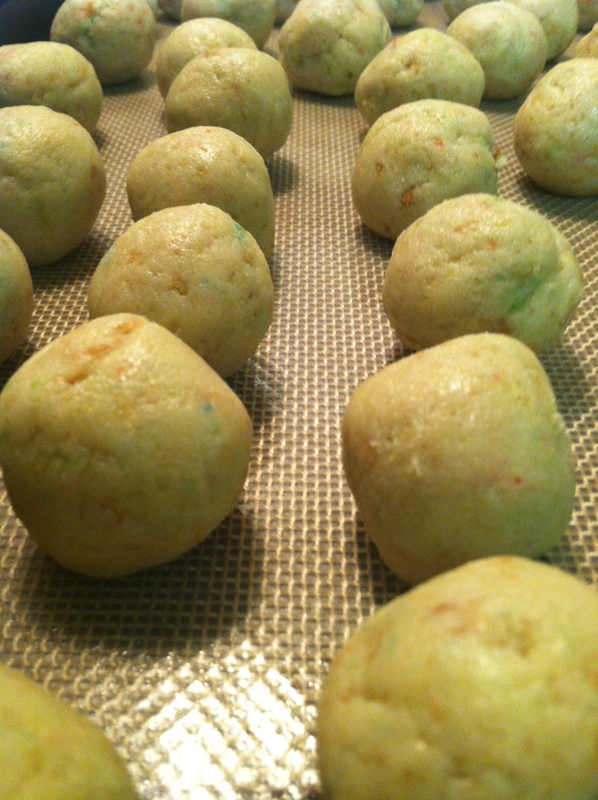 Then using two small spoons, coat the cake ball fully, and put back on a parchment lined baking sheet. Step 6: Don’t worry if you can’t get a nice smooth chocolate coating. I have yet to figure out the trick to perfect it. But it all tastes the same whether it looks perfect or a little rough around the edges. 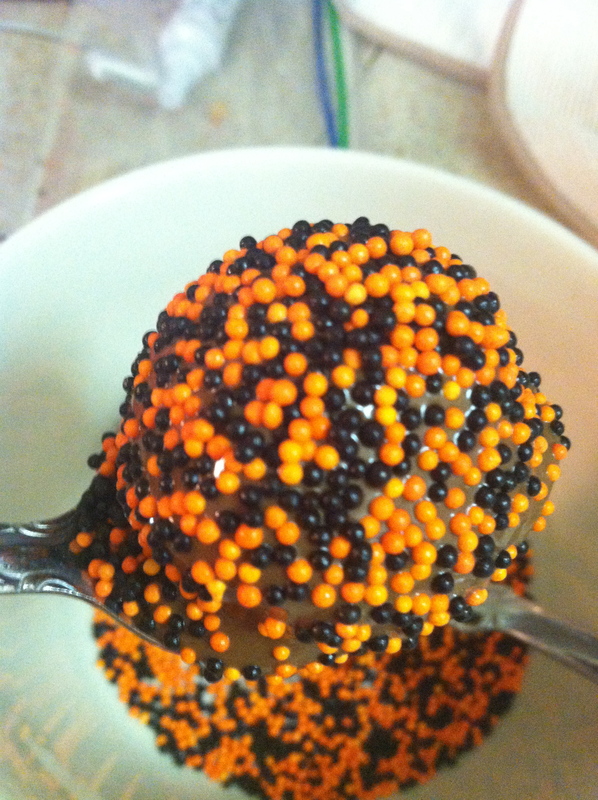 If you are using sprinkles, you will want to sprinkle them on immediately after putting the cake pop on the tray. The chocolate starts hardening right away. Jack-o-lantern. 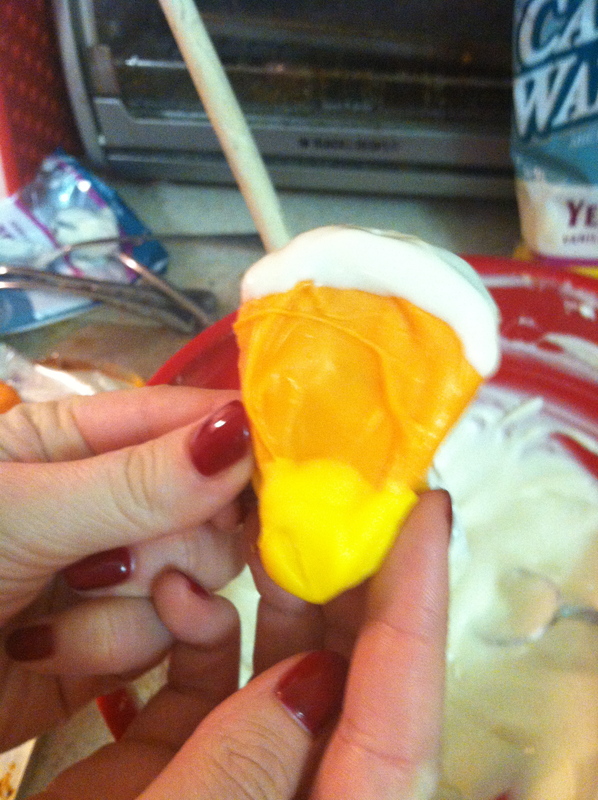 Don’t worry, not going to quit my day job to go into cake pop decorating. 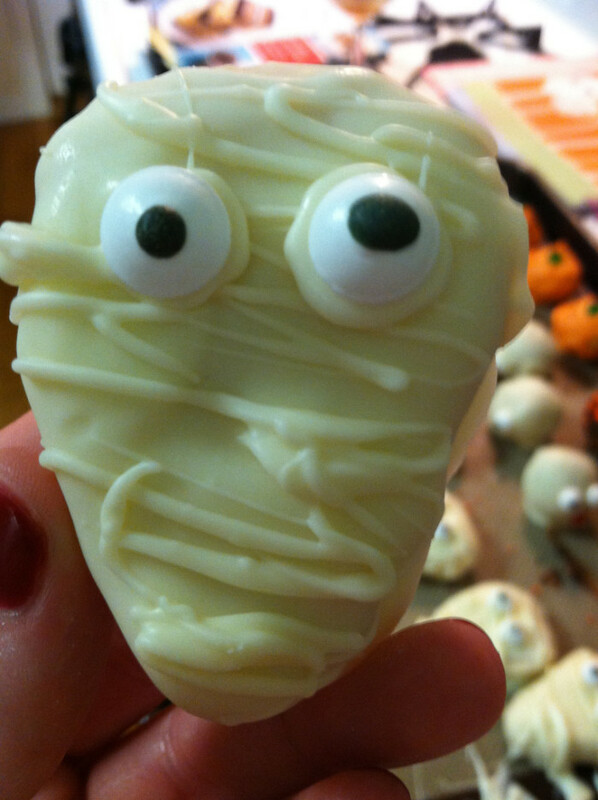 Cake pop mummy. Pretty proud of this one. We created this totally on the fly. The cake pops were a huge hit among both the kids and grown ups at work on Friday. 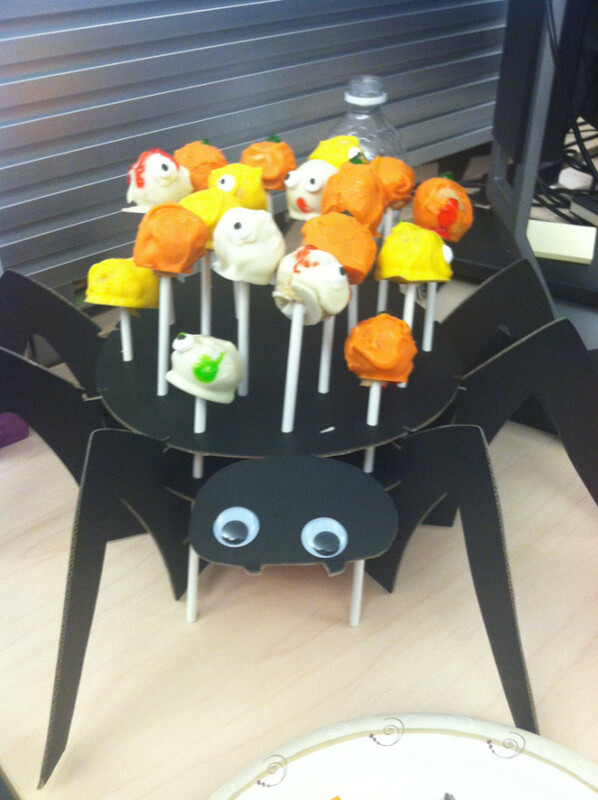 I even got this cute little spider cake pop holder from William Sonoma. So that’s it. A long post to make up for a lack of posting mid-week last week. I’ll get up today’s Oatmeal Raisin cookie post sometime tomorrow. Probably once I go crazy from hurricane Sandy cabin fever.